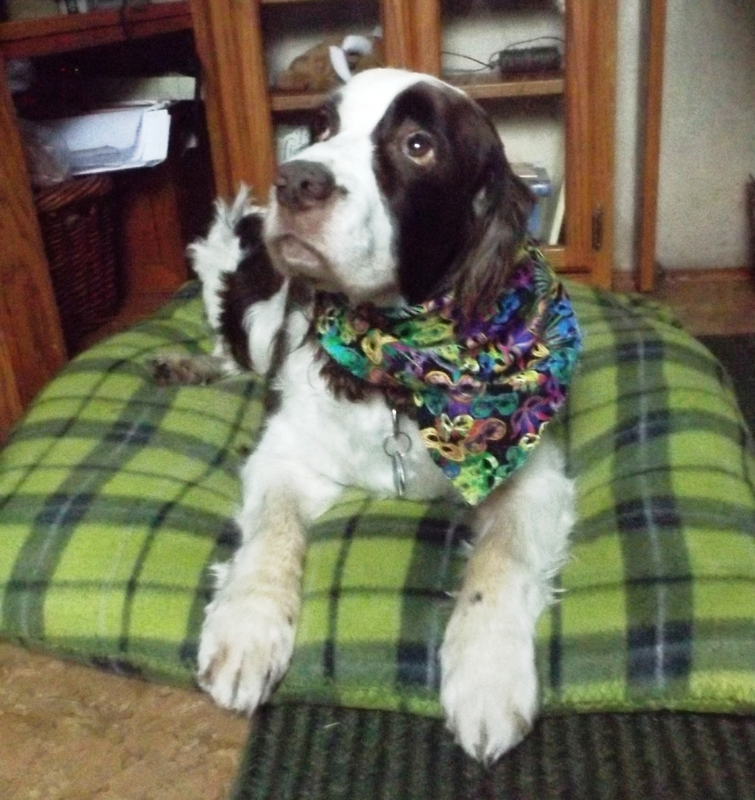 We have been on the road two years and not yet have I told you about our sweet old dog. Today Pink tells her story. Unlike me, she’s more laconic than loquacious, but she does have a tale to tell. And here she goes. Or call me Chumley, or Big Baby, or Pootie, or any of another dozen names my people have tried to hang on me. I prefer their first choice of names, Pink. Before that I had another name and another family, but all I remember of them is the children. I loved my kids. I lost my first family. Either they turned me out onto the street with a bad case of heartworms, or I went off exploring and then couldn’t remember the way home. It’s all a blur now. The dogcatcher eventually caught me, weak and hungry, fifteen pounds underweight. 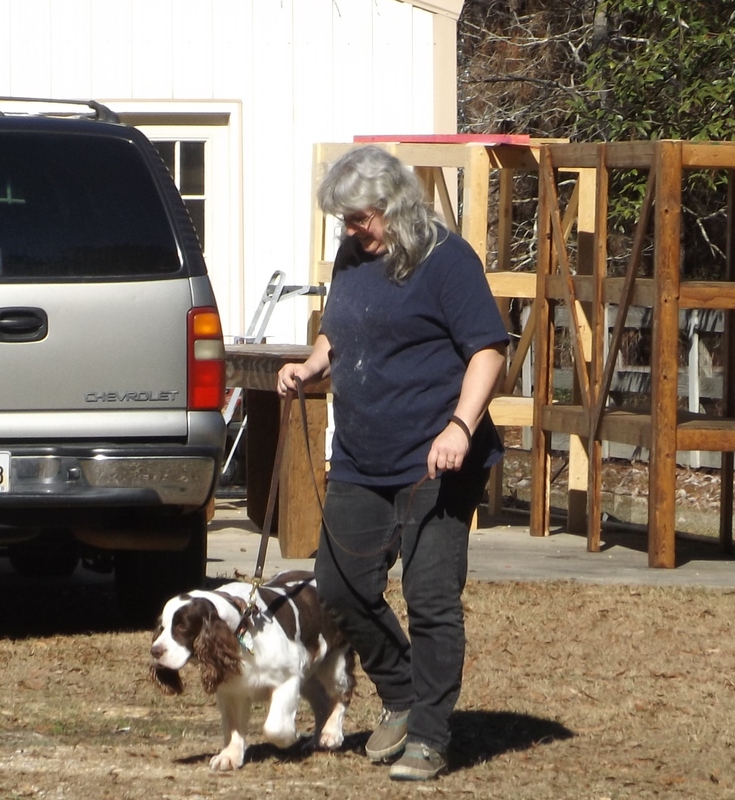 Raleigh’s English Springer Spaniel Rescue Association got me out of Death Row a day ahead of the needle and found me a short term home with Springer people. There was another Springer with them, also being rescued. She was good at catching food on the fly, which forced me to learn that trick. She was mean to me, but I never bit back; I only cried to my people. They got her adopted and in time, I became their big puppy. That was in 2007. Along the way I’ve fought cancer, both breast and adrenal. I have endured four surgeries. The last was two years ago. I helped Jackson beat his cancer, and he and Kat got me through mine. You too can take care of a rescue dog. You don’t need to be perfect. It doesn’t matter if you’re occasionally negligent with grooming or late with meals, nor if you don’t walk her as often as she’d like. Regular chow and a place to sleep out of the rain and cold are a huge improvement over life on the street. Having someone who cares about you is right up there with food and shelter. That’s true be you man, woman, or beast. What a sweet post! We have 3 rescue dogs. One we got from the pound on the very day she was to be put down. The other two were dogs we found running loose and couldn’t find owners or anyone looking for them. Rescue dogs are the best! I’m glad you liked it Jen. The springers we raised from pups were wonderful as well. I just love the breed; there’s a lot of puppy in them. Love this post, Jackson! We can’t take on a rescue dog now as we barely have room for our Paisley, but I am volunteering at the Rescue organization here in Playa del Carmen (our winter spot this year), and it’s incredibly rewarding…I did a little blog post about it. Your Pink is precious; thank you for taking her in and providing her a loving home. Doing what we can is, I think, what matters, Em. If ten percent of us did something, we would help many a beast and influence some of the other human 90%. It’s a small thing, but a good thing. Playa del Carmen? Se habla Espanol? It scared me so much to cross the border to get new glasses and a dental checkup and cleaning I had to knock back a Bud at 9:00 a.m.
Un pocito. Have been taking audio & online Spanish lessons off and on for the past three years, but it’s still a challenge. We read it much better than we speak it, and understanding it as spoken by Mexicans is the most difficult…but we’re making some progress. There’s a fair amount of English spoken in Playa, though, since it’s more of a tourist city, but when we’ve traveled inland, we’ve found much less to zero English spoken. We can get by. Google Translate and a pocket Spanish dictionary are our friends! It’s well worth the occasional frustration to escape winter! Stay warm up there…. Love the post, and hearing Pink’s story. No dogs allowed here, but I was adopted by the sweetest cat in the world. He showed up in the yard in the wee hours of the morning. I was up late, and heard him howling. 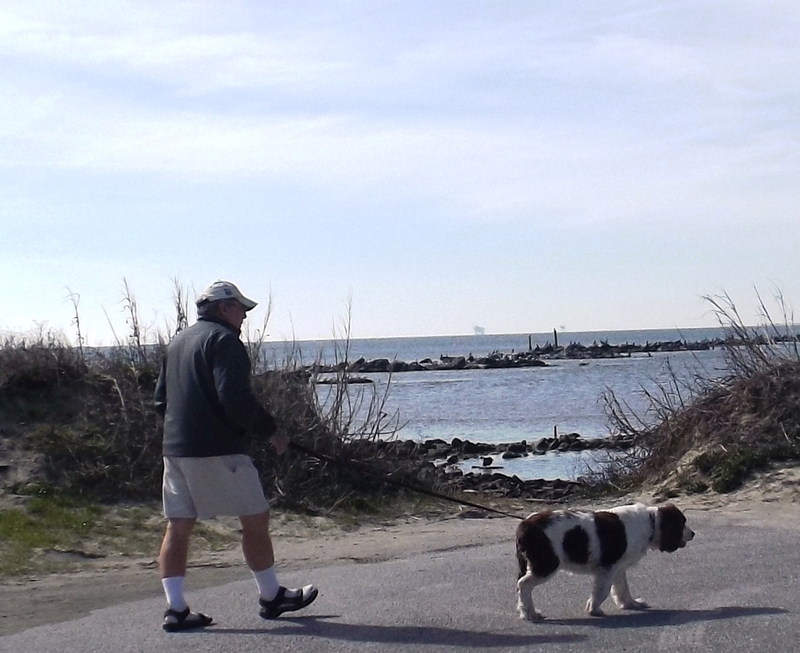 In this area, many people up here on vacation dump their “summer pets” on their way back to wherever they call home. P.S. Ah, yes. High school Spanish. I remember it well. Since I could not roll my R’s back then, I moved on to study French, but please do not ask me to speak either one. Those we need who also need us are the best.